The FTSE 100, CAC and DAX have opened up down by around a third in early trading, but have recovered some ground in the first thirty minutes of trading. The FTSE 100 is gaining strength after Lloyd’s group posted results that were not as bad as feared, and at the same time, UK house prices increased by 1.1% month on month. At 08.30 GMT (09.30 BST) we have UK Manufacturing Production and the Services Purchasing Managers Index. Analysts are expecting small improvements on the previous reading, which could give the FTSE a further boost this morning. At 12.15 we have US ADP Non Farm Employment Change which is again expected to show improvements on the previous reading. With US Non Manufacturing PMI and Crude Oil inventories also to come today, markets could be jittery throughout the day until these announcements are out of the way. It’s honours even between the Euro, Pound and Dollar so far today with no significant moves made amongst these currencies. The Yen has been strong this morning though, especially against the Euro, Pound and Aussie dollar. The AUD/JPY (Aussie dollar, Japanese Yen) is down around half a percent this morning as oil prices dip slightly. Today’s busy news schedule could have a major impact on the commodity influenced AUD/JPY, making it today’s pair in play. 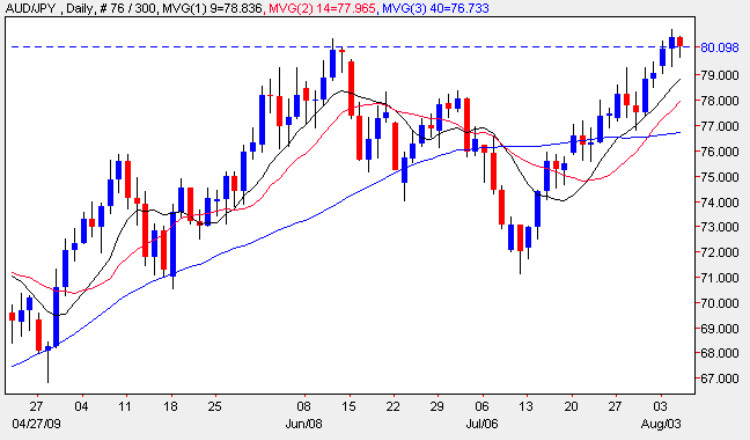 A good way to play this could be a breakout trade, predicting that the AUD/JPY will touch either 82.00 or 78.00 over the next couple of days.